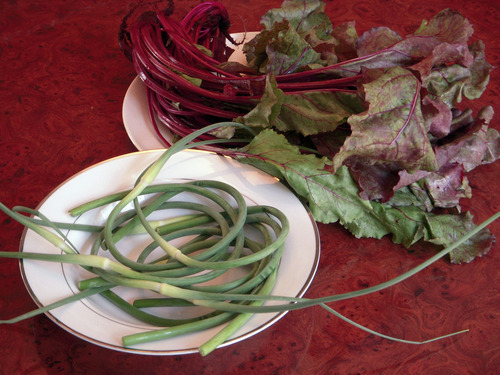 Have You Tried: Garlic Scapes? Garlic scapes are the thin stalks that grow up out of hardneck garlic. The stalks would flower if left to grow, but they are generally removed by farmers and gardeners so the garlic bulb is able to continue developing. Their removal is good for the garlic, but it is also good for you, as these firm curly stalks are tasty! I think the texture is similar to a raw green bean or stalk of asparagus, and the mellow garlic flavor complements a number of dishes. I was inspired by Love and Olive Oil’s Beet Green and Garlic Scape Bruschetta, and decided to meld those flavors into a salad. Add a little olive oil to a pan, and saute the garlic scapes for 3 minutes or so. Add in the beet greens and saute until greens are just wilted. 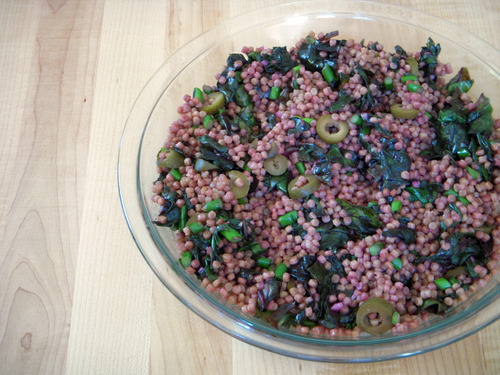 Remove from heat, add the mixture and the olives to the couscous and toss to combine (my couscous got a fun pink tint from the beet greens!). Season with salt and pepper to taste and serve. I liked this simple salad as is, but it would be an easy salad to dress up with some chunks of feta or maybe a zesty lemon herb dressing. Enjoy! This entry was posted in In the Kitchen (recipes & more) and tagged garlic, garlic scapes, lindsay jean hard, local food, Real Time Farms. Bookmark the permalink.